Photoshop Elements may have a reputation for being a little lightweight in comparison to its big brother Photoshop CC, but its compositing tools are just as powerful. Like a mad professor with a welding torch, you can create all manner of mechanical mash-ups with a few simple skills. So why not fuse together a character like our lamp-robot here? In this tutorial, we’ll show you how it’s done. Along the way you’ll learn essential Photoshop techniques, from making precise selections to painting layer masks – a key skill for many Photoshop tasks. We’ve provided several start images for you to use, but the real joy is in shooting your own. As our lamp-robot demonstrates, electrical items make for good subjects as the clean lines and hard edges mean they’re both easy to cut out and simple to combine. 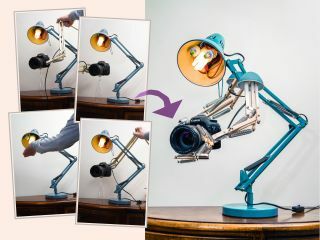 We used two anglepoise lamps, and simply held one up next to the other in various positions to form the arms and hands while the camera sat on an upturned glass. If you want to shoot your own pictures, keep in mind three things. First, all the elements should be shot under the same lighting and angle, so use a tripod. The second key factor is to use a simple backdrop, like the white wall here. This makes it so much easier to bring everything together, as you don’t need to be so precise with your selections. Thirdly, follow the rules of light. Keep the lighting direction consistent, and add shadows where necessary. If these follow the real shadows within the scene (in direction and hardness/softness), they’ll look more natural. STEP BY STEP: Light, Camera, Action! In Expert mode, open images lamp01-07 and go to lamp02. Grab the Polygonal Lasso tool. Make a rough selection over the wall in the top right corner then hit Ctrl+C. Go to Lamp01 and Ctrl+V to paste. Grab the Move tool and drag the piece into place. Go to Lamp07 and make a rough selection of the ‘arm’ then copy and paste it into Lamp01. Move it into place then add a layer mask. Grab the Brush tool, set colour to black and use a soft-edged brush to hide parts of the layer that would be behind the other elements. Next we can perfect the mask with more precise painting. Black hides, and white reveals. Zoom in close and paint to reveal or hide the layer where necessary. Use ] and [ to resize the brush as you paint, and Shift-click to paint a straight line between two points. Go to Lamp06. Grab the Quick Selection tool and paint over the bottom part of the lampshade. Click Refine Edge and increase Smooth and Radius. Copy and paste it into the main image. Hit Ctrl+T to resize, then paint a layer mask to blend it, creating a shoulder. Hit Ctrl+J to copy the shoulder. Highlight the lower layer, delete the layer mask and mask it to make a new shoulder behind the first. Add a new layer above the ‘Background’ layer. Alt-click to sample a shadow area then paint in shadows where the arm meets shoulder. Copy and paste in the ‘eyes’. Then make a selection of the ‘hand’ in lamp02, paste it in, transform it to fit and blend with a mask. Repeat for the other hand. Next, make a new layer. Use the Spot Healing and Clone tool (set to ‘Sample All Layers’) to tidy any messy areas.